Day Two at Bungsamran Lake in Bangkok saw English angler David once again fishing for Mekong Catfish and Giant Siamese Carp. 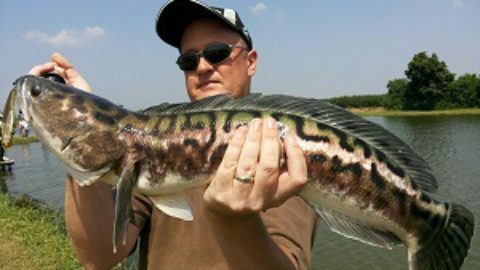 After previously catching a large haul of Mekong Catfish the day before the UK angler once again fished from a Bungalow. Fishing with a float out into the centre of the lake soon resulted in a Mekong Catfish picking up the bait and powering off across the lake. David wound down into the unseen monster catfish causing the rod to arch over into its full parabolic curve. The fish responded by embarking on a series of unstoppable runs against the already tightened clutch of the reel. A further ten minutes passed before the Mekong Catfish was brought into netting range where it proceeded to charge underneath the fishing platform in an attempt to evade capture. After several minutes of trying to bully the fish from the underwater snags the fish was finally brought out of the danger area and into the net. 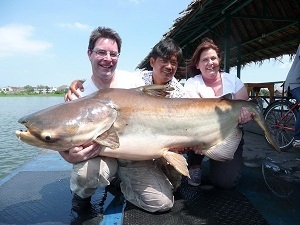 The Mekong Catfish was estimated to weigh 40-45 kg’s and was released after a few quick photographs. David and his wife continued fishing well into the afternoon catching a succession of big Mekong Catfish and Striped Catfish. A change over to bottom fishing tactics soon saw more takes forthcoming with several more Mekong Catfish falling to the anglers ranging between 15-25kg’s.